The HB-G 900F was a special MSX2 model aimed at the professional market. It has built in features to pilot Genlock (for video capture) and laserdisks. The case and keyboard of the HB-G900 is pretty similar to the one of the HB-500 and HB-700. The main differences are the extra video connectors and the built-in RS-232 port. The second cartridge slot found on the HB-500 and HB-700 is replaced by the diskdrive and a second bay remains available for another diskdrive. The second cartridge slot can be found at the back of the unit. The extended ROM (94 KB total) is holding the BASIC instructions to pilot the Genlock (HBI-G900), RS-232 and laserdisks. 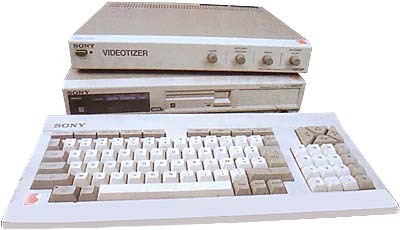 The HBI-G900 (Videotizer) unit sold separately was used to capture external pictureq through a PAL encoder and evenually mix it with pictures generated by the computer. A special version of the software Multiteloper was developped to take advantage of the special features of this computer. The price of the software and the hardware was strictly limiting them to video edition professionals. The HB-G900F was later replaced by more advanced models such as the HB-F900 and HB-G900AP. The coolest thing is that one of these systems could be found in the MIR space station, apparently used for video capture. Pictures and videos showing the HB-G900 and HBI-G900 in the space station, can be found on this site. Pictures and info from Olivier Hustin. see more Sony Hit-Bit G900F Ebay auctions !